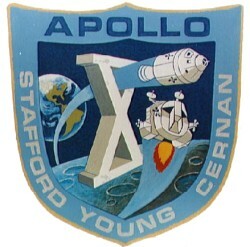 Apollo 9, which was composed of a command module (CM), a command service module (CSM), a lunar module (LM), and an instrument unit (IU), was launched by a Saturn V rocket on March 3, 1969, from Cape Kennedy. The crew were Commander J.R. McDivitt, CM pilot D.R. Scott, and LM pilot R.L. Schweikart. 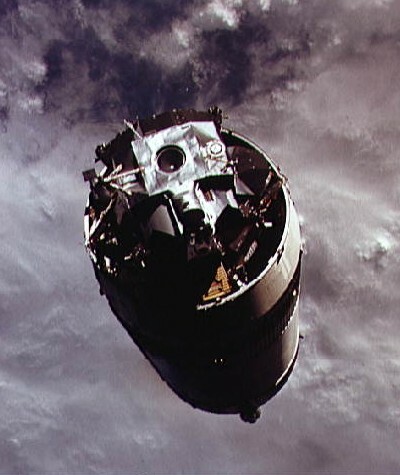 On Apollo 9 the CM and LM were separated and some maneuvers, including docking, were completed, but the LM did not land because this was an earth-circling mission. It had its own propulsion, communication, and life support systems. The LM was jettisoned into Earth orbit before the CM re-entry, where it stayed until its orbit decayed on 23 October 1981. All systems on all spacecraft worked nearly normally during the mission. 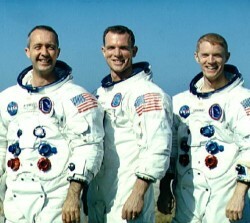 Apollo 9 splashed down in the Atlantic Ocean on 13 March after a mission elapsed time of 241 hrs, 0 mins, 54 secs. The Apollo 9 Command Module "Gumdrop" is on display at the Michigan Space Center, Jackson, Michigan.